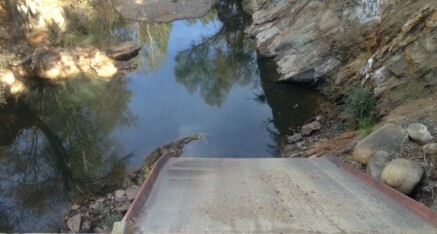 When Los Padres dam was built the only way for fish to migrate out of the dam and downstream was over the lip of the dam and down the concrete spillway. Unfortunately no one thought about fish when the spillway was ended 40 feet directly above solid rocks. This, of course, was not good for steelhead survival. On one of the work days for the gabion project the CRSA contact from CDFW, Randy Bentine, was helping with the project when everyone noticed the river was full of mud and dead fish. Cal Am had drained the dam to work on the bottom valve. Bentine estimated the fish loss was about 250,000 small steelhead. 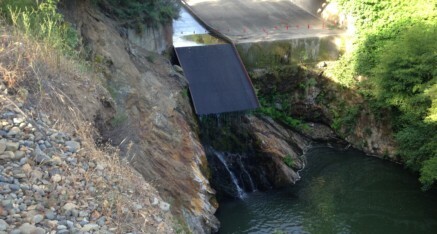 Because of this event, and the fact it was noticed by CRSA and CDFW, Cal-Am was required to build a spillway extension to mitigate for the loss of the fish. The metal extension is still visible today. If you are standing on the bridge over the end of the Los Padres Dam spillway look downstream and you can see the extension that has saved countless steelhead. When doing so think of what a small group of dedicated individuals can do to help.